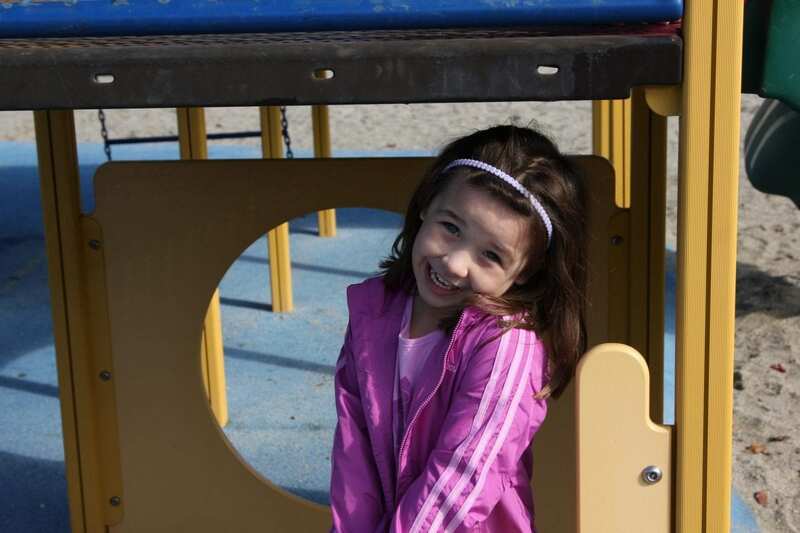 Five year old Kaelyn Rincand enjoys her peaceful playground experience. Given the jungle rules of some playgrounds, where the biggest and toughest tend to dominate, consider the scene recently at El Camino Creek Elementary. A recess came and went, with 822 children running loose during a sublime spring afternoon and no body cried, got punched, got hurt, got left out of any game. No body got into a fight outside, nor was anyone dragged back inside the classroom, where the teacher had to waste time and energy sorting out the dispute. El Camino employs an anti-violence program called Peaceful Playground, created by Cal State San Marcos education professor Melinda Bossenmeyer, Ed.D., that aims to topple the centuries-old Darwinian pecking order of the schoolyard. “The difference is active children,” said Bossenmeyer, and educator with a background in physical education. She says the problem with most schoolyards is that there is not enough for all the kids to do, so they run around disrupting the games of others and generally get into trouble. Or else they hang around the fringes or sit idle. Because public schools may not have the money to buy more playground equipment or hire more supervisors, Bossenmeyer approaches the dilemma with low-tech, low-cost method to get the children moving again, but playing nice. Standard play equipment generally covers only a fraction of a school’s play space, so she simply expands the playing area by repainting the lines and introducing more games and diversions, a package for which she charges $1000. She has 100 games in her arsenal, ranging from standbys like tetherball, to games such as Man from Mars, Jolly Ball, and Pickle. Enticing them to play is just part of the process. When kids can’t get along at a Peaceful Playground school, they can settle it with their fists-that is, with that old game of Rock, Paper, Scissors. It works like this: say the kids start arguing about whether the ball was out or in bounds in handball. Pupils have been trained not to respond in the ordinary ways: arguing, pounding each other until the weakest one runs away crying; or using their manipulative skills to see whether they can get the group to gang up on their opponent; or tattle. Instead, Peaceful Playgrounds kids throw their fists into a rock, paper, scissors mode. That neutralizes the battle, helps decide who is right, and help the participants move on before the recess bell rings. At El Camino Creek, the system appeals to fourth-grader Dustin Atlas. Who says there were bullies at this old school, but not at this one. “It’s easier on this playground, there’s more space for people to do their thing,” says10-year-old Alex Mason. Although the playground is no bigger than the standard; it just seems so big to him because kids are not just clustered around the limited play equipment. Granted, El Camino Creek is about as far from the jungle as you can get. It’s a gleaming new school that draws its student body mostly from new neighborhoods of homes that sell for more than a half-million dollars. It scores at the top of the list for the state’s high achieving schools. Yet playgrounds are the great levelers, no matter where they are, and El Camino Creek principal Blow says kids here behaved and misbehaved pretty much the same way as anywhere else she’s taught. The program started when the school opened, brought on the campus by Encinitas Union School trustees, who had heard Bossenmeyer speak at a conference. Bossenmeyer began her program 20 years ago and runs it out of her Murrieta home. It is part of the increasingly crowded field of businesses that market themselves as experts on school safety in the post-Columbine era. Many anti-violence programs use student leaders as volunteer mediators and counselors to help diffuse tensions, as El Camino Creek does. But Peaceful Playgrounds goes further than just targeting some segments of the school, because it involves everyone, from the janitors to the children themselves. Everyone learns the rules of the playground in her program, the adults even carry around a palm-sized rule book, and everyone learns the games, not just the kids and the playground monitors but the principle and teachers. Bossenmeyer boasts that more than 8,000 schools nation wide use her program, including other Encinitas school and Escondido School District. One of the most effective keys to diffusing playground problems is the consistency of a program, says Blow. One of the biggest sources of conflicts on elementary school playgrounds is when kids play games and make the rules up as they go along, maybe because they want to be mean and exclude a kid, or because they are more skilled at the game and want a greater challenge.